Pinterest Secret Boards have lots to offer individuals and businesses! As the name says, they’re secret! You can choose to be the only one who ever sees your Pinterest Secret Board content, or you can invite others to view and add more pins to the board. Including clients! Share visual content (graphics/photos) you’ve created or ideas you’ve gathered – for a client or your organization – in a private environment. Gather ideas, tips and information in one non-public area for review by you or you and your team. Secret boards are a great way to capture what others in the marketplace are doing and to learn from them. Pin interesting content (ideas, tips, information, etc.) to a secret board as a holding place, for sharing images, etc. over a spaced out period of time, rather than all at once. #2: As the creator of a secret board, you are the only one who is able to see the content. However, you can choose to invite others to collaborate with you on your secret board(s). #3: Only the secret board creator can make the board public. Those who have been invited to collaborate on the board can NOT make the board public. #4: There is no limit to the number of secret boards you can create or participate in. #5: When you add a pin to a secret board, it won’t show up anywhere else on Pinterest – not in the category sections, anyone’s search results, your followers’ home feed, your own home feed, or even pins or activity pages on your profile (source: Pinterest). #7: When a secret board is made public by the creator, all the pins, comments, etc. added to the board will become public too. #9: Invitations sent to others to collaborate on a secret board are made via email. Invitations to collaborate with anyone other than the creator must be approved by the creator. #10: To create a secret board or to view your secret boards simply scroll to the bottom of your Pinterest profile. Login to Pinterest from your laptop or desktop. Click on your profile picture/name to go to your profile. Find and click on the ‘Boards’ link. It appears as one of the tabs beneath your bigger/main profile picture. Click on the ‘Create board’ link in the left corner area of all your created boards. Next, create a ‘Name’ for your board, then turn on/click the ‘Secret’ link before clicking the ‘Create’ link. Your Secret Board has been created! Click on the pencil icon that shows just above your secret board name. c) Enter the email addresses of ‘Collaborators’ you would like to have access to the board. Voila! You have created your Secret Board! Must Pinterest Secret Board Collaborators Have A Pinterest Account? Anyone you invite to be a collaborator on your secret board must have a Pinterest account. You can add anyone as a collaborator on your board as long as they have a Pinterest account. They do not need to follow you, nor do you need to follow them. 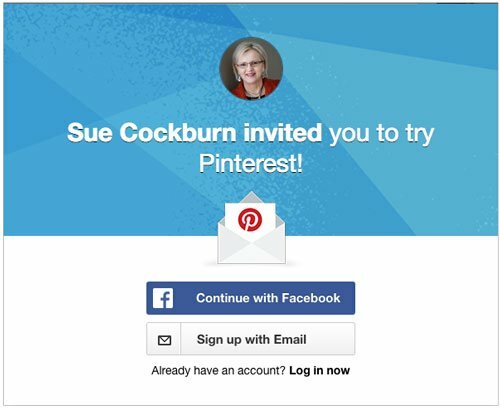 If someone who you would like to collaborate on the board doesn’t already have a Pinterest account, you can invite them to sign up for Pinterest by sending them an email. They will then have the opportunity to ‘Sign up with Email’ or ‘continue with Facebook’. To continue with Facebook they will need to sign in to Facebook, or already be signed in to their Facebook account. Open your secret board and click on the word ‘Invite’’ that appears next to your profile picture. In the ‘Edit your board’ pop-up window, find the ‘Collaborators’ field at the bottom of the pop-up form. Once you have chosen a name to invite or entered an email address, click ‘Invite’. Once the person invited has accepted your invitation to join the board, assuming they have a Pinterest account, their name will appear along with any other collaborators to the right of the secret board name when the board is open. #1) Open your secret board and click the pencil icon appearing above the board name. #2) In the ‘Edit your board’ popup window that appears, move the toggle from right to left to make the board public. #3) Now go to the pin you want to share and share it in the normal fashion. #4) After sharing the pin either leave your board as public or edit the settings to move the toggle to the right to make the board secret once again. Having Trouble With a Pinterest Secret Board Invitation? If you are having trouble with a secret board invitation, Pinterest suggests making sure you and the person you are inviting are following each other. Technically, you do not need to do this. But, if you are having problems inviting collaborators, see if doing so solves the problem, advises Pinterest. The Pinterest website provides some information about secret boards. Click here to view secret board information on Pinterest. Updated March 19, 2019.